Linköping University (LiU) offers the LiU International Scholarships for new international students from countries outside the European Union/European Economic Area (and Switzerland), who have significant academic potentials and excellent results. The scholarship award is open to students who have applied for a masters programme at Linköping University through the online national application website (see link below), who have chosen a programme at Linköping University as their first priority, and are required to pay tuition fees. Scholarships within the programme, LiU International Scholarships, will result in a tuition fee waiver of between 25-100% (i.e. tuition fee reduction by 25, 50, 75 or 100%). Citizens of ALL countries (EXCEPT EU/EEA countries). However, this scholarship programme is NOT OPEN for students from the following 11 countries: Bangladesh, Bolivia, Cambodia, Ethiopia, Kenya, Mali, Mozambique, Rwanda, Tanzania, Uganda and Zambia. Students from these countries should apply for the Swedish Institute Study Scholarship. For the first year of any masters programme. If your chosen masters course is a two-year programme, and you are a second year applicant for this scholarship, then information on how to apply will be posted by the school. Please see official website for more details. 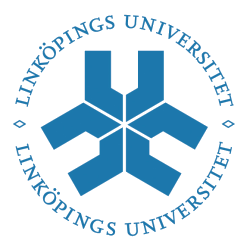 To apply for a LiU International Scholarship, you must first apply for the programme you wish to study at Linköping University using the online national application website, (s) on www.universityadmissions.se. Application for a LiU International Scholarship is by filling out the electronic application form on Linköping University’s website. This form will only be available during the scholarship application period (see deadline dates below). The application for the selected master's programme(s) on www.universityadmis must be made prior to making a scholarship application on Linköping University’s website, as necessary information for making the scholarship application is obtained during this process. Deadline to apply for Masters studies is 15th January 2018. Scholarship application period is from 6th of April until 9th April 2018. An application form for the scholarship will be available on the official website in early April 2018. Scholarship applications will only be processed after the corresponding application for master’s programmes on www.universityadmissions.se has been completed, required documentation and the application fee has been received. Only applicants fulfilling the eligibility requirements for the master's programme applied for will be considered for a scholarship. All data entered in the scholarship application form must be verifiable by the documentation submitted in the national application process www.universityadmissions.se. Linköping University (in Swedish: Linköpings universitet, LiU) is a state university in Linköping, Sweden. It was granted full university status in 1975 and now one of Sweden's largest academic institutions. The school is research-based with excellence in education and a strong tradition of interdisciplinarity and innovation. Education, research and PhD training are the mission of its four faculties: Arts and Sciences, Educational Sciences, Health Sciences and the Institute of Technology. My name is Merina Method, undergraduate student from Sokoine University of Agriculture (Tanzania)in Bsc. Agricultural Economics and A gribusiness, I scored a GPA of 3.64. Kindly I request for tuition scholarship to study any Economic masters. Thanks for your consideration.